Learning Management System - Sencia Canada Ltd.
Informetica is an innovative learning management system (LMS/LCMS) that provides everything you need to create an effective training experience for your entire learner population from a single web-accessible system. Each Informetica system is tailored for your company branding and configured for your specific training needs including course offerings and catalogues, registration requirements, certification paths, and email alerts, with the least amount of effort. In fact, we work with clients that have unique setups for tens of thousands of users that belong to different organizations. We provide single sign-on and integrations with well-known external systems such as such as PeopleSoft, SAP, Salesforce.com, and many more. Easily create SCORM compliant courseware for internal training or export for resale using Informetica’s publishing tools. Start training your employees immediately using courseware created within Informetica or import third-party SCORM and AICC courses. Use custom and preset reports to follow learner progress in real-time and track employee compliance through electronic affidavits. 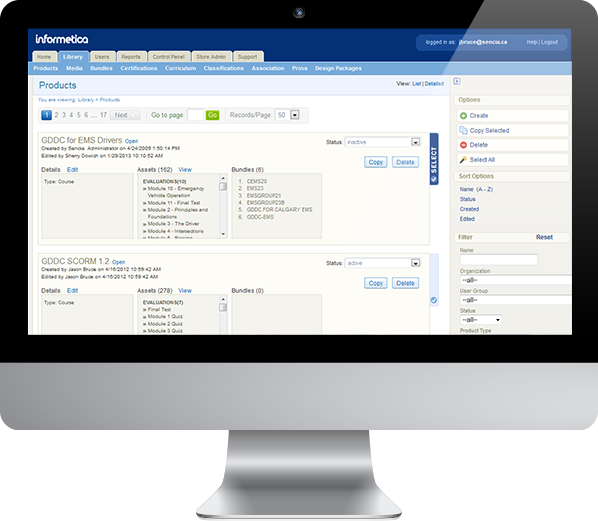 Discover Informetica, our powerful Learning Content Management System that can be customized to meet your specific needs.